Search for Life: Where Should a Europa Lander Touch Down? Jupiter's icy moon Europa is seen in a composite image created by NASA's Galileo spacecraft. If humanity ever launches a life-hunting mission to the icy surface of Europa, the probe should probably touch down on the "chaos terrain" of the ocean-harboring Jupiter moon, a new study suggests. 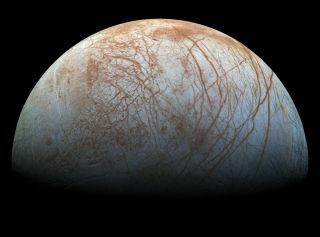 Europa's complex chaos regions — which feature numerous cracks, ridges and other signs of geological activity — may offer a way to sample the moon's huge subsurface ocean of liquid water, which is buried beneath an estimated 60 miles (100 kilometers) of ice, researchers said. "If we can someday sample and catalog the chemistry found there, we may learn something of what's happening on the ocean floor of Europa and maybe even find organic compounds, and that would be very exciting," Brown added. A map of Europa shows a few large areas with large concentrations of what are thought to be salts. This work revealed three basic categories of surface material on Europa: water ice, which dominates the satellite; chemicals that result when sulfur and oxygen (which likely originate from eruptions on Jupiter's volcanic moon Io) react with ice; and a set of compounds that remain unidentified at the moment. Then, the team overlaid these composition readings on a Europa map constructed with images taken by NASA's Galileo spacecraft, which orbited Jupiter in the 1990s and early 2000s. They found that the mystery compounds matched up with the distribution of Europa's chaos terrain. "It was a stunning moment," Fischer said in the same statement. "The most important result of this research was understanding that these materials are native to Europa, because they are clearly related to areas with recent geological activity." The researchers don't know what the chaos-region chemicals are, but they think the compounds could provide a window into Europa's possibly life-supporting ocean. "We think we might be looking at salts left over after a large amount of ocean water flowed out onto the surface and then evaporated away," Brown said. "They may be like the large salt flats in the desert regions of the world, in which the chemical composition of the salt reflects whatever materials were dissolved in the water before it evaporated." On Europa, "chaos terrains" consist of regions where the icy surface appears to have broken apart, the broken pieces moved around, and then those pieces froze back together. NASA has no concrete plans to land a spacecraft on Europa's surface, but the agency is developing a probe that will perform dozens of flybys of the moon to better assess its life-hosting potential. This roughly $2 billion mission, which does not have a formal name yet, should launch by the mid-2020s, NASA officials say.